In his post earlier today, Bryan Campen mentioned Kevin Kelly’s 02019 Unthinkables – a set of predictions he made in 1999 that were specifically meant to be outlandish or – eponymously – unthinkable. With 12 years of perspective on the predictions, Kelly concludes his post by saying that he doesn’t think any of them will come true. The fertility rate in China drops below the replacement level, and nothing the government can do can get Chinese couples to have more than 1.5 kids each. For the first time China encourages immigration to keep its huge economy going. The data imply that the total fertility rate, which is the number of children a woman of child-bearing age can expect to have, on average, during her lifetime, may now be just 1.4, far below the “replacement rate” of 2.1, which eventually leads to the population stabilising. 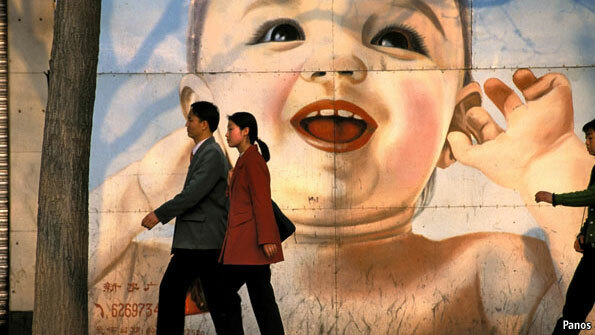 The Chinese government, despite calls by many academic demographers, continues to stand firm on the one-child policy enacted in 1980. If those industries don’t develop quickly enough, the government may have to look to immigration to supply the labor China’s economy needs and the second part of Kelly’s prediction won’t seem so unthinkable, either.